Salzburg is a wonderful city, and I fell in love with it immediately. It’s compact, walkable, historic, cultural – I just had to write this Salzburg itinerary, and help you feel the same about it! You’ll fall in love with the mountains, the crisp, clean air, the tidy streets… and if you don’t, you’ll definitely fall in love with the food. OMG, the food. I’m pretty certain that I’m going to need to take a wheelbarrow with me next time, just to get me back to my hotel in a more efficient manner. But whilst I work out just exactly how I’m going to get a wheelbarrow into my backpack (do you think it’ll set off the airport security scanner? ), you can read this Salzburg itinerary and learn exactly how to see the city’s best sights in just two days. Even better, Salzburg is a walker’s dream: all of the main sights are in or near to the city center, and it’s very unlikely that you’ll need to take public transport at any point. You certainly won’t get bored though, as Salzburg is stuffed to the brim with cultural sights and other delights – what else would you expect from the city of Mozart‘s birth? So let’s pull on our perfectly-powdered Mozart wigs, and get exploring! By the way! This article may contain some affiliate links. These incur zero extra cost to you, and might actually save you some time or money. Clicking the links and making a purchase helps towards the running of this blog, and all extra funds are spent on wheelbarrow-sized backpacks. Good news for visitors: Salzburg is capably served by W.A. Mozart Salzburg International Airport. Aside from getting you used to everything being named after Mozart, it’ll also get you to your destination nice and quickly – the airport is small, and you’ll be through it in no time. There’s definitely no need to worry about getting lost in sprawling terminals! Once you’ve collected your bags and made your way through the airport, you can either catch a Line 10 bus into town (it’ll cost around €3), or get a taxi. To be honest, the airport really isn’t far from the city itself, so you can probably skip the budgeting this time, and go for the more comfortable option. When I visited, the taxi ride took about ten minutes, and cost in the region of €7. If you’re arriving by train (especially if you’re doing what I did, and doubling up a trip to Salzburg with a visit to the nearby German city of Munich,) then you’re also in for some good news. Salzburg Hauptbahnhof is not only nice and close to the city centre – a 15-20 minute walk; take the Line 170 bus if you don’t fancy hoofing it – but it’s a gleaming, modern station. There’s plenty of facilities for the newly-arrived, from toilets to luggage lockers, and even its own travel agent. As you’d expect, the hotels in Salzburg’s historic center located near the River Salzach are more expensive. If you really want to treat yourself, have a look at Hotel Sacher. As well as being the most famous hotel in Salzburg, you can officially brag that you’ve stayed in a “grand hotel”; it’s five-star rated, and it deserves every little bit of its fame! Thinking a bit more budget-friendly? In that case, have a look at the MEININGER Hotel Salzburg City Center. It’s a little further out, but thanks to Salzburg’s compact size, it’s still only going to take about fifteen minutes to make it into the city center. If neither of these appeal, you can do what I did, and stay at Hotel Vier Jahreszeiten. I thoroughly recommend it: it’s close to town without being in the bustle, the staff are extremely friendly and helpful, the rooms are comfy, and the hotel WiFi is excellent. I can personally attest to this, as I spent an entire evening using it to watch the BBC coverage of the Eurovision Song Contest. DON’T JUDGE ME. All settled in? Excellent! It’s time to see the city! Cafe Glockenspiel has been sitting scenically on the edge of Mozartplatz since 1925, though its history is actually far older than that – it used to be a stable for some seriously pampered horses. These days, it simply pampers your taste buds instead, by serving the most perfectly-baked croissants, with twin pots of jam and marmalade to flavor it up. And if you’re thinking that a croissant doesn’t seem terribly Austrian, then you’d be wrong: they actually originated in Vienna! If the weather’s good, then get here nice and early to secure a table on the edge of the square. You’ll have a perfect vantage point for watching tourists take selfies with the statue of Mozart, and for cooing over the horse-drawn carriages which occasionally canter past. The cafe also does a rather awesome strudel, if you’re the kind of person who likes cake for breakfast (who doesn’t?). The first thing you’ll notice about Salzburg is the massive fortress looming over the city, perched on a perfect position on top of a hill. Yup, that’s Hohensalzburg Fortress, one of the largest medieval castles in Europe, and an absolute must-visit. And good news: you don’t have to walk up the hill to visit! Yay! If you walk on to Bierjodlgasse street, you’ll see the FestungsBahn; a funicular railway station which will, after you’ve bought your ticket to visit the fortress, carry you up with minimal effort. And what a view once you get there – from one side, you can see all over the city of Salzburg (when I visited, I managed to time it just as the bells at the Dom were ringing, which was utterly lovely). If you walk to the terrace cafe on the opposite side, you’ll be treated to a breathtaking view of the Alps. Soak it all in with a drink and the very reasonable food. The Fortress itself is highly impressive. It dates back to 1077, but was constantly expanded and improved through the centuries, until it became the behemoth it is today. You can certainly devote a good amount of time to looking through all of the displays, from medieval weaponry to a modern regimental museum. Also be sure to check out the Golden Hall – once the site of fancy banquets, its glorious ceiling, painted to look like a starry sky, it now hosts concerts of Mozart’s music. In the winter months, there’s also a Christmas market selling crafts and Austrian delicacies in the castle’s courtyard. If you’re reading this and thinking that a Christmas market in a medieval castle sound like the most cozy, Christmassy thing in the world, then you would probably be right. Btw! If you’ve got a hankering for an Austrian Christmas market (and with lebkuchen and glühwein on the menu, why would you NOT want to go to an Austrian Christmas market? ), check out this brilliant guide to visiting Vienna at Christmas by the lovely Lia at Practical Wanderlust. She’s one of the finest bloggers out there – go check it out, and be inspired! Yes, we can’t delay it any longer – it’s time to go and pay tribute to Salzburg’s most famous son. You can’t go anywhere in Salzburg without seeing Mozart tributes and memorabilia everywhere you turn, and it all focuses on the house he was born in. You’ll easily spot it on Getreidgasse: aside from the almost constant mob of visitors outside and large flags, its also next door to the fanciest branch of the SPAR convenience store that you’ll ever see in your life. For a €10 ticket, you can pop upstairs into the Mozart family home, where young Wolfgang was born in 1756. Aside from the family portraits and information panels which describe family life and the characters involved, my favorite was the ‘holy relics’ which have been carefully preserved and protected down the centuries. As well as Mozart’s first violin (which is adorably small) and buttons from his jacket, there’s a perfectly-preserved lock of his hair. Let that sink in a bit. One of the most famed humans ever to walk the earth, and you can see a literal part of him, looking as fresh as if it were snipped off yesterday. I don’t know about you, but I find that quite mind-boggling. It’s a very good museum, and although it looks like a bit of a tourist trap from the outside, it’s most definitely worth visiting. It’s been carefully curated and looked-after, and its a fascinating insight into the man. I didn’t know an awful lot about him before I visited, aside from the facts that everyone knows, but it definitely caused me to read more about him – and an interesting character he was too. You can also indulge any urges you’ve ever felt for Mozart memorabilia in the museum shop. Mozart teddy bears? Mozart chocolate? Mozart golf balls? Mozart rubber ducks (including a duck dressed as 80’s pop star Falco dressed as Mozart)? They’re all here! A little bit of a walk now, but don’t worry – it’ll be worth it! Go straight ahead as you come out of the Mozart Geburtshaus, and turn left when you meet the River Salzach. Keep walking until the road starts going upwards and curving to the left, and you’ll eventually come to the Augustinerbrau. This wonderful beerhall should definitely be on your must-do list, and it’s a completely authentic experience. When I visited, I think my boyfriend and I were the only non-Austrians in the place, and it’s a pretty big place! Go up the staircase on arrival, and you’ll find yourself in a big courtyard, beautifully canopied by trees. If the weather’s good, then you definitely want to sit outside; you’ll see a lot of Austrian families turning up with massive picnics, so you definitely won’t be alone! And indeed, you’ll probably find yourself sharing with other people, and making some new friends. But you want to know about the beer, of course! It’s a bit different to what you might be used to: you go inside, buy a tankard (well, more like rent it), give it a wash, and then get it filled with beer which has been brewed on-site. It’s very light, crispy, and available in large quantities. What more could you want! And if you’re peckish you can buy food from the snack stands in the courtyard: we bought bratwurst with fries in a delicious sauce, and it was one of the best meals I had on the entire trip. Even if you’re not a big drinker, the Augustinerbrau is definitely worth a visit. It’s a wonderful experience, and completely worth it purely for the feeling of taking part in a Salzburg tradition. We visited on a Sunday afternoon, and it was clearly a big part of local families’ day – we chatted with the locals, and made friends with a couple who were dating long-distance in Austria, meeting up in Salzburg at the weekends. It felt like being a Salzburger for a few hours, and I loved it. If you’re wobbling a little after your trip to the Augustinerbrau, you’ll be pleased to hear that you’re about to walk it off, and get a bit of food to soak it up! Die Weisse is over on the other side of the River Salzach, but the walk there is completely worth it. Prepare yourself for the best schnitzel you’ve ever tasted, because Die Weisse is not only a brewery (yes, two breweries in one day – I’m good to you, right?? ), but it also has a brilliant selection of Austrian foods. I heartily recommend that schnitzel I mentioned; I had a few on my trip through Germany and Austria, and the one at Die Weisse was my favourite. And don’t neglect that slice of lemon which it’ll be served with; it really adds to the flavour! If you’re still full of energy, or sufficiently full of beer, you’ll also be pleased to discover that Die Weisse also has a bar with a dancefloor and DJ decks. Feel free to get down and boogie with the locals, before staggering back to your hotel. Sleep well, you’re going to need it for day 2! Recovered after last night? No? We’ll start off nice and easy then, with a trip to the awe-inspiring Schloss Mirabell gardens! As with quite a lot of places around Salzburg, you’ll recognise the location from The Sound Of Music (indeed, you can do a TSOM tour around the city if you’re so inclined) – this was where the Von Trapps sing “Do-Re-Mi” and hop about on the steps, unaware that these days, they’d be mowed over by visitors in minutes. With that in mind, it’s definitely best to get to the gardens early. Not only is it one of Salzburg’s most popular attractions, it’s also free, which guarantees crowds! If you want my top tip, I’d advise buying yourself a takeaway breakfast, and nibbling it on a bench within the gardens itself. You’ll beat the rush, and have a far more memorable meal. If it’s still quiet when you’ve finished, head over to the statue of the dancer (Tänzerin) at the far end of the gardens for a perfect view of the Hohensalzburg Fortress guarding the city. The Schloss Mirabell itself also has an interesting story attached to it; namely that it was built in 1606 to impress the mistress of the then Prince-Archbishop. It clearly worked; they ended up having 15 children. These days, you can actually go and see a Sound Of Music show at the theatre, in which all the cast are portayed by puppets. So during the “Lonely Goatherd” scene, you have puppets using puppets. Puppetception! Salzburg’s Cathedral has undergone a fair few changes over its history – it was originally founded in 774AD, but rebuilt after a fire in 842. Its received changes and improvements right up until the Second World War, when it suffered damage during a bombing raid, but it remains the absolute heartbeat of Salzburg. I didn’t get to enjoy it as much as I would’ve liked, thanks to the majority of the building being roped off for an event, but I was very impressed with the the part of it I did see. Not only can you see the font in which Mozart was baptized (complete with some adorably derpy lions on the feet), but the building gives off a wonderful feeling of calm and peace. It’s impressive and stately, but also small enough to feel friendly and part of the community. Much like the city of Salzburg itself! Be sure to spend some time in the squares outside the cathedral, too – the horse-drawn carriages with their gorgeous equines, who all seemed to be a lovely caramel colour with glossy golden manes, wait directly outside. If watching them and giving them the occasional pat on the nose doesn’t appeal, pass through the square to the plaza at the side, where a market is held. Certain days also see live music being played here: when I visited, there was an oompah band playing music from Pulp Fiction. Worth the journey alone, I think you’ll find! Yes, I’m advising you to go to a cemetery. And yes, I’m completely serious. Petersfriedhof was completely the hidden gem of my trip – it wasn’t somewhere I’d planned to go; we almost walked into it by accident. But it’s such a wonderful little site, with a lot of historic significance. Respectfully wander through the graves of the great and good of Salzburg – I particularly liked the family tombs, which were so beautifully maintained and decorated, with the name of family members going back over the centuries. It’s definitely melancholy, with photos of more recent arrivals placed lovingly in the tomb alcoves, but it’s a visual reminder of the link which holds Salzburg together, and the families who have stayed in the area and maintained the city’s traditions. There’s a couple of notable graves to spot, too – Maria Anna Mozart, Wolfgang Amadeus’ elder sister, is interred there, as is Harry J. Collins. He was a U.S. Army Major General who liberated Dachau Concentration Camp, and who took immediate action to make sure that the freed prisoners received medical help, food, and shelter. Many of them were moved to Salzburg after their rescue, and Collins later retired there. As I visited the cemetery just days after visiting Dachau and seeing the horrors which occurred there, I couldn’t help but say a little thank-you at his grave. But the big attraction of the site is the catacombs, which have you climbing a stone staircase into the cliff rising above the cemetery. They’re absolutely ancient, but have a feeling of being used regularly over the centuries – it won’t take you long to look around, but it’s worth it for the atmosphere and fascination of going into a catacomb, and the gorgeous view of the city from the top. And it only costs €2. I like a good novelty souvenir, as well as the occasional tasteful one, and Getreidgasse is the place for you! There’s a whole variety of goodies for you to take back home – expect to see a whole smorgasbord of Mozart-related items (including Mozartkugel – delicious chocolates which you will get hopelessly addicted to as soon as you leave the country), music boxes, edelweiss-related jewelry, teddies in lederhosen, and much more. It’s also a brilliant place to stock up on Christmas tree decorations. This is a part of the world that knows how to do Christmas properly, and you’ll find an array of unique decorations to take back home with you. If you fancy something a little different, how about treating yourself to lederhosen or a dirndl? The traditional dress isn’t confined to history or stereotypical promotional leaflets – you genuinely do see plenty of locals strolling the city, wearing their finest. If you want to join in, get yourself to Stassny, which has some absolutely beautiful examples for sale. You won’t think of them as a novelty anymore, but as genuinely beautiful garments. The Alter Fuchs (or “Old Fox”) is the perfect cozy den in which to finish off your weekend in Salzburg. The rooms are warm and atmospheric (especially the Fox Den), and decorated with more foxes than you can count. Keep an eye out for the bandanna-clad foxes, who are halfway between being adorable and looking like they’re about to mug you. But aside from the foxes, the highlight is the food – the menu is filled with all the Austrian classics (go for the sausage selection! ), and the portions are absolutely huge. My boyfriend and I visited after a full day’s walking, in which we hadn’t had anything else to eat all day, and we still struggled to finish our meals. Parents will be relieved to hear that there’s smaller portions for kids, listed as being “for little foxes”. It’s a lovely, friendly restaurant which will make you feel right at home, and you can put your feet up and reflect on all you’ve seen over the weekend! 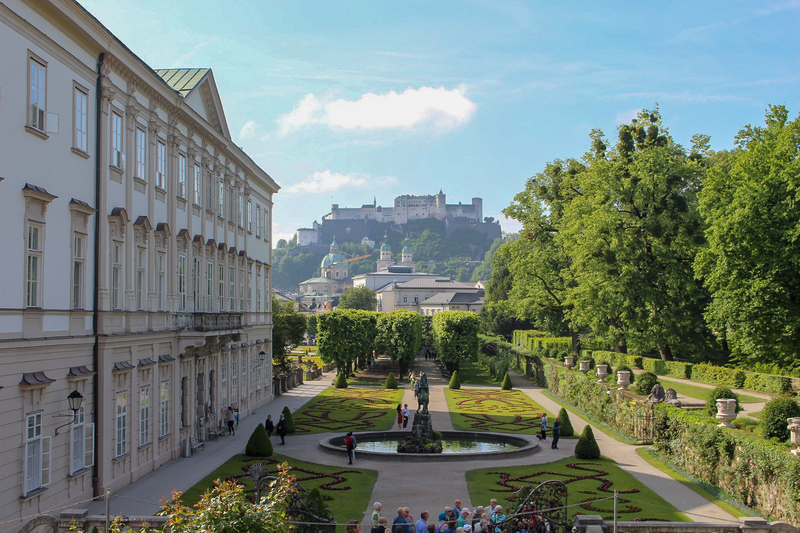 I hope this Salzburg itinerary helps you fall in love with the city just as much as I did. Before I visited, I didn’t really have a strong sense of what Salzburg would be like, other than reassurances from my boyfriend that I’d love it there. He was right. It’s a glorious place, a historic place, a place which has its fame and is comfortable in the knowledge that it deserves it. It’s no coincidence that the two things people most commonly associate with Salzburg – Mozart and The Sound of Music – both involve music; its power and its beauty. Salzburg will sing a siren’s song to you, and it’s impossible not to listen. Enjoyed this Salzburg itinerary? Pin the image below to Pinterest to save it for later, or share using the buttons below and let everyone know what an awesome place it is! So many awesome ideas for a weekend trip, thank you. I also love how you included the maps, that is very useful when planning out what we are near. Beautiful photos and a comprehensive guide. Thanks so much. I’m headed this way for Christmas so I’m going to find your guide really useful. Thank you. Wow Salzburg looks just like a fairy tale! I never watched Sounds of Music before actually now I really want to watch it and visit Schloss Mirabell Gardens! How awesome you can see all this in 2 days. Tha k you so much for sharing! I have never been to Austria or Salzburg but I would love to try that Schnitzel and see the historic center and that magnificent forest. Reminds me a bit of my grandma since she was German. Thanks so much! This is an amazing place to go for a trip of 2 days itinerary at Salzburg is really a wonderful trip. Fantastic images thanks for sharing about every place in a brief. Go ahead with more beautiful posts!